This is the Eastern wall of a diptych of murals that face each other over the site of a weekly farmer's market in the Noe Valley neighborhood of San Francisco. Both murals show a scroll-like ribbon weaving through the vegetables. Within the ribbon, there are bird's eye views of the neighborhood. On this Eastern wall, the ribbon contains a scene from Noe Valley's past at the top left, and an imaginary ecotopian future at the right edge. At the top left of the ribbon, is a sepia-colored view of the neighborhood in the past. It shows the intersection of 24th Street and Castro in the 1930's. Several landmarks depicted within this panel have since changed or no longer exist. Among these are the Noe theater, The old Municipal railway depot, the Castro St. cable car (of the kind nicknamed "dinky" due to their compact size), as well as some victory gardens here and there. This is a view of the neighborhood transformed into an ecotopian alternative. It is based on the view of the intersection of 24th and Church streets in San Francisco, looking north. The various shops and establishments at that street corner were converted in the painting into an alternative equivalent. For example, the bank became an heirloom seed bank, the fitness center became a pedal-powered energy generator, and so forth. There is a "Mission Slide", and the "Potrero Skyway" aerial tramway detail was suggested by a real MUNI planner I interviewed for a brainstorm, Peter Albert. He was one of several professionals in fields related to city planning whom I asked, basically, to dream with me. I asked what infrastructure changes would bring them joy to see, if neither neither liability nor the complexity of civic processes had to be taken into account. At times, it seemed like some of their original inspiration for entering their line of work in the first place was emerging from the conversation. Several acquaintances who inspire me with their work towards a better future are depicted within this part of the mural. Some of them visited the mural and suggested details within it. For the unveiling of the murals, we transformed the space in front to imitate the future utopia painted in this panel. We covered the asphalt with pretty rugs, brought out pillows, furniture, potted plants and built a stage. Some of the farmers market stalls stayed on site, a clothing swap and several bits of gift economy were happening. Many of the people depicted in this panel came out and performed, spoke, or did what they already do that I would want in a SF utopia. 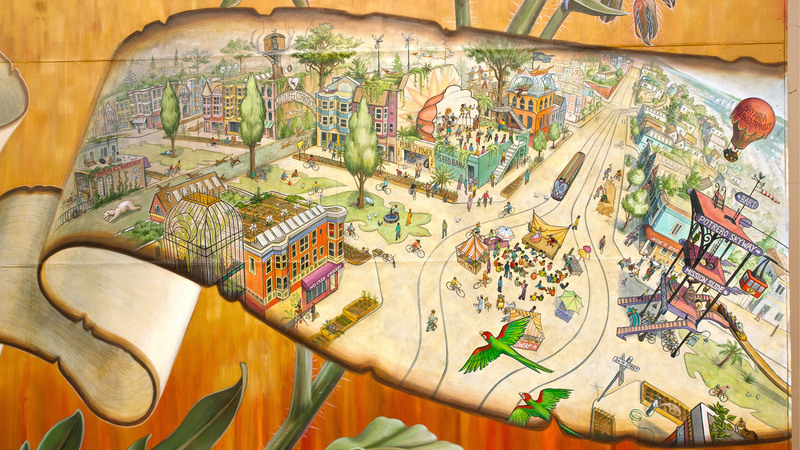 We even created a puppet show within the mural about food politics, ending with a full on street parade. See the gallery of this memorable event. Below, a 6 min tour of both murals by Mona.